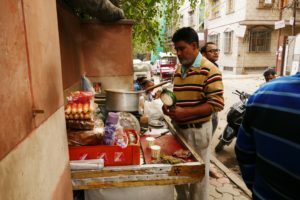 ‘Nothing opening until 10am’ the hotel attendant advised us with a wobble of his head, as we left to explore Chandni Chowk Bazaar, and he was right. Apart from a couple of office workers sitting on makeshift wooden stools drinking chai waiting for the gates of the DCP commission to open, the street sweepers cleaning rubbish left from the previous day and a congregation of rickshaw drivers sleepily sprawled on the passenger seats of their bikes, the normally chaotic street was empty. Our immediate adventure plans foiled, we did what you do in this situation… stop, drink chai and contemplate! We sip the deliciously sweet gingery hot brew and chat with a fellow who has boldly ventured over and engaged in a conversation with us to practice his English. He proudly announces how wonderful his mother country India is, and how much he loves Australia, although he has never been, and we take an obligatory ‘selfie’ with him. We finish our tea and the crowd that has gathered to look at the foreigners, errupts into laughter at our attempt to thank the chai-wallah in Hindi ‘Dhenyavaad’! We wave goodbye to all our new friends and set off down the road that is still semi life-less. We have decided to continue our walk until 10am rolls around. As we make our way down the main road, the shutters on a few shops are starting to open, but it primarily vegetable sellers, that have set up makeshift blankets on the roadside, displaying their fresh produce. 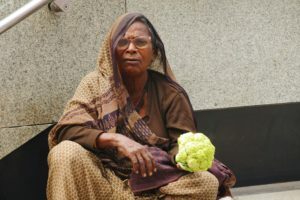 Old women with wrinkled leathery skin and dirty, frayed, thread bare sari’s sit cross legged with handkerchief sized displays next to bare footed teenaged boys with wild unbrushed hair in dusty skinny jeans and torn tshirts with fruit piled precariously high on wooden carts. As we approach an intriguing little lane way off the main road that has quite a few people entering. I motion to Cadence to turn in so we can check it out. 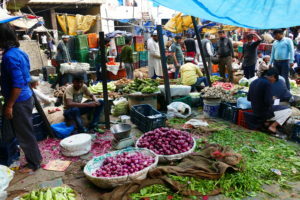 The entry is no more than 2 meters wide and as we carefully navigate around vendor tables, over broken drain slabs, piles of rubbish and rotten off cuts of unwanted vegetable stems, we get swept up in a wave of movement. From behind I hear someone yell out with urgency ‘Chalo, Chalo’! I glance back to see a small man bent at almost 90 degrees carrying a white rice sack larger than his body, veins popping from the side of his head and sweat glistening on his bare head. We try to move to the side, but the laneway is now crowded with people, pushing and jostling each other in both directions. 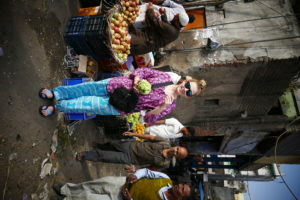 I usher Cadence to move faster and get out of the way, when suddenly the lane opens up into an enormous courtyard full of fruit and vegetable vendors. The rainbow of coloured produce is vibrant, and the cacophony of buyers and sellers bargaining is deafening. We find a spot out of the way, and survey the area. I pull out my camera to take photos, when a man starts yelling at us and waving his arms like crazy. I shake my head, unsure of what he is saying, but wonder if we have inadvertently stumbled into a private market, and should get out before we get mugged! We start to head back towards the laneway exit when a second man, sitting on a pile of green cauliflower stems, yells and points back to the first man, who is now motioning us over and pointing at something around the corner. I hesitate for a moment, assessing the potential danger of following this stranger around the building, when I hear him shouting, ‘Got, Got’, as he continues to point and wave at us. 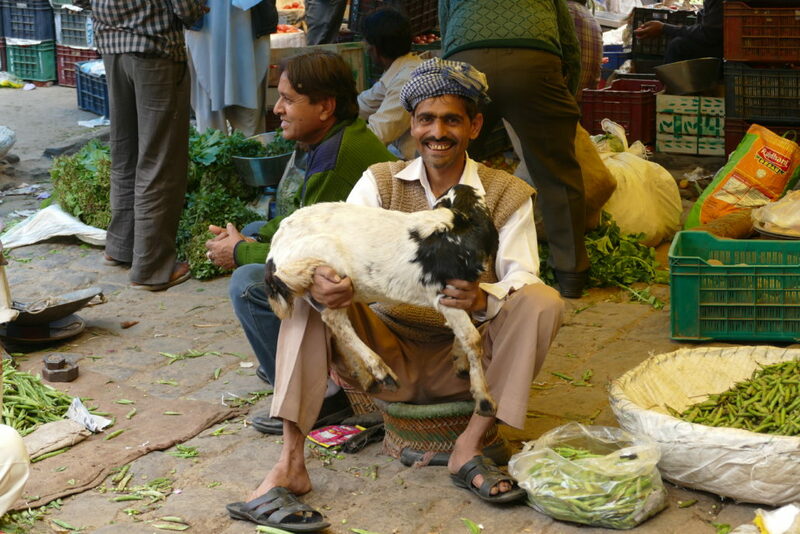 We strain to see behind the man, and spy a ‘Goat’, munching on green scraps. I smile, and the man breaks out into a big grin, still waving at us madly to come over. I think he wants to show us his goat, I whisper to Cadence. 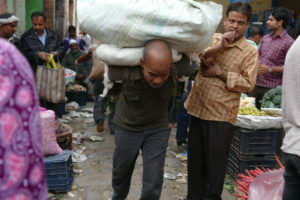 We make our way through the crowd to the man who is now carrying the goat. All the other men around him are laughing and pointing at the man and then back at my camera. I hold up the camera and he poses for a picture. 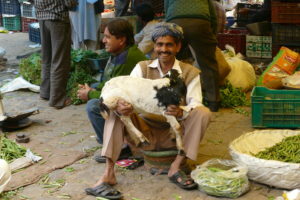 They laugh again and he promptly drops the goat onto the green scrap pile and gestures for me to show him the photo. He roars with laughter, waves at me to show the picture to all his friends and promptly presents Cadence with a green cauliflower. We thank the man, and as we walk out onto the street, Cadence looks at me and says, ‘what the hell am I supposed to do with this?’ And we both start laughing. 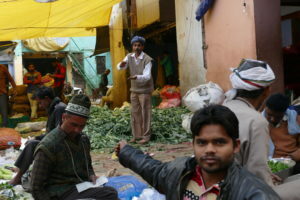 We continue our journey through the side streets of Chandni Chowk, spotting a beggar squatting on the sidewalk. Cadence gently approaches and carefully hands her the cauliflower. We both feel good about our decision to pay it forward and agree it has gone to a worthy cause, as we had no way of using this generous, yet unusual gift. Later that day, we look at the picture I took of this lovely act of kindness, and I am sure the look in the old woman’s eyes says, ‘What the hell am I supposed to do with this?’ We both laugh! Only in India!!! Thanks for the marvelous posting! I quite enjoyed reading it, you are a great author.I will always bookmark your blog and may come back someday. I want to encourage continue your great posts, have a nice weekend!